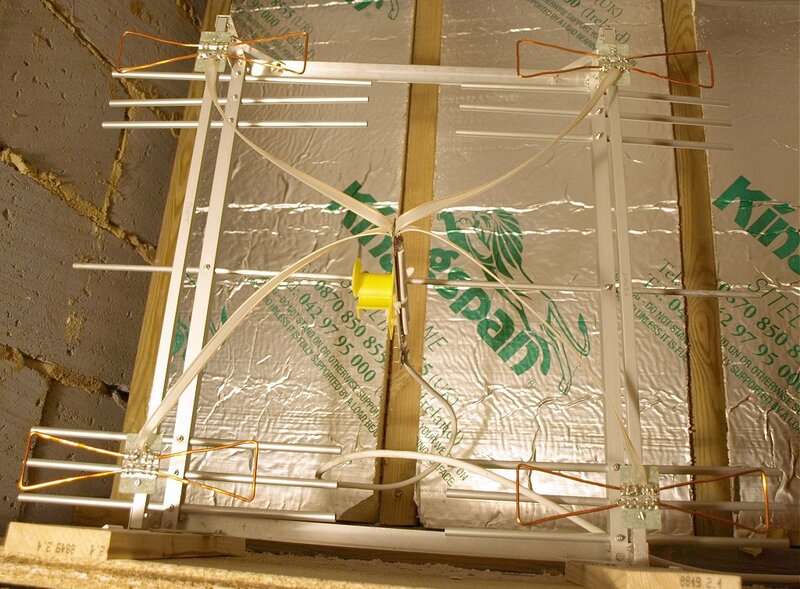 This article describes the design and construction of a compact TV antenna designed for use in lofts or indoors where there is limited space and suitable for coverage of the wide frequency ranges that may be allocated to digital TV multiplexes. Design details, a 4NEC2 file and photographs are given below. Due to building work our original loft space was reduced to a small residual wedge with limited access, so that an antenna wider than about 0.7m and taller than about 0.5m would be too big. 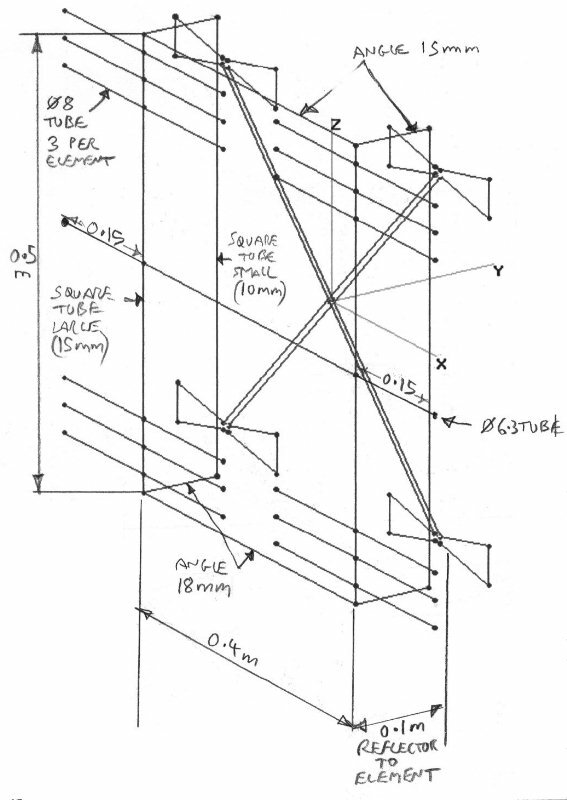 An earlier loft antenna that I had built, which was effectively a stacked pair of Lazy-H arrays fed in parallel, performed adequately and had a gain of about 11-12dB over 470-700 MHz according to 4NEC2, but was now too large, with a mesh reflector 610 x 900mm, to get into the available space. 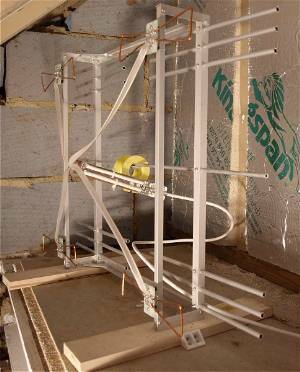 Thus a new antenna design was needed, which would also beat the performance of the existing Yagi on the chimney as the previous loft antenna had done. "An antenna can be treated either as a receiving device, gathering the incoming radiation field and conducting electrical signals to the output terminals, or as a transmitting system, launching electromagnetic waves outward. These two cases are equivalent because of time reversibility: the solutions of Maxwell's equations are valid when time is reversed." Bernard F. Burke, Francis Graham-Smith, An Introduction to Radio Astronomy, 2nd ed. / Cambridge University Press, 2002. A collinear array is an array of elements whose centres lie on a straight line and whose principal direction of radiation or reception is perpendicular to this line. Thus a broadside, two-dimensional array can also be thought of as an array of parallel collinear arrays. A classic broadside array comprising dipole elements spaced approximately a half wavelength apart in two dimensions was the Sterba, patented in 1929 by Ernest J. Sterba (US patent 1885151). 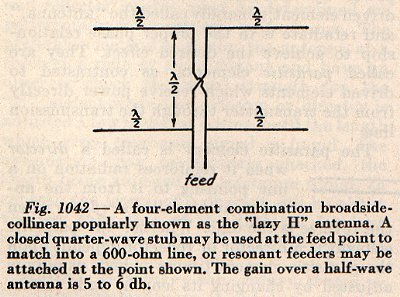 The Butterfly Dipole Antenna (1938) was patented by Philip S. Carter (US Patent Number 2175253) and has an impedance versus frequency characteristic considerably wider than that of a normal dipole. The folded dipole, which provides an impedance of four times that of a normal dipole, with a flat impedance versus frequency characteristic over a broad frequency range, was patented in 1937 by Philip S. Carter ((US Patent Number 2283914) - the extension of this principle to the Butterfly Dipole is fairly obvious. "Connecting the terminals of a dipole directly to a co-axial cable can cause problems because this connects the outer co-axial conductor - the 'screen' - to one of the antenna terminals. The outer surface of the 'screen' is no less an antenna than the dipole limb so, in the transmitting sense, some of the current conveyed by the cable, which is normally carried on the inner-surface of the 'screen' (and the outer surface of the inner conductor), is diverted away from the dipole limb. Meanwhile, all the current carried by the inner conductor flows into the other dipole limb. So the current distribution in the dipole loses its symmetry, and current flows in an additional radiator, the outer surface of the screen, that can have any imaginable geometrical relationship to the dipole. Small wonder then that the radiation pattern becomes distorted..."
It is equally important not to connect coaxial cables directly to twin-wire balanced cables. A balun transformer should be used to couple between 300 ohm twin-wire cable and 75 ohm coaxial cable. 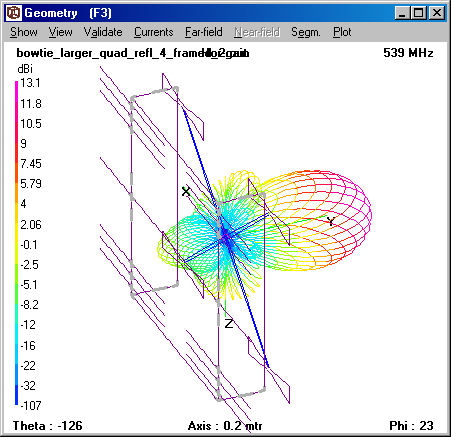 The design of this antenna is based on a broadside square array of 4 dipoles, similar to the Lazy-H, nominally spaced half a wavelength in each direction. Of course, half a wavelength is a varying dimension over the range of the Band IV and V TV frequencies; from 316mm at 474MHz to 176mm at 850MHz so the antenna dimensions must be a compromise. The frequency range for the digital and analogue TV transmissions from my local TV transmitter at Crystal Palace, London, is in Group A, 470-606 MHz, although analogue Channel 5 is transmitted from Croydon nearby until digital switchover in 2012. After switchover, Crystal Palace may transmit something on Ch. 42 at 642 MHz, which is in Group B. Therefore Group A/B coverage was a requirement and full wide band coverage desirable (or I would have to build/buy a new antenna if I moved, which is not on!!). Commercial Yagis designed for Group A tend to have gains from 9-14dB but fall off rapidly out of band, whereas broad band antennas may have gains below 9dB over much of the bandwidth. 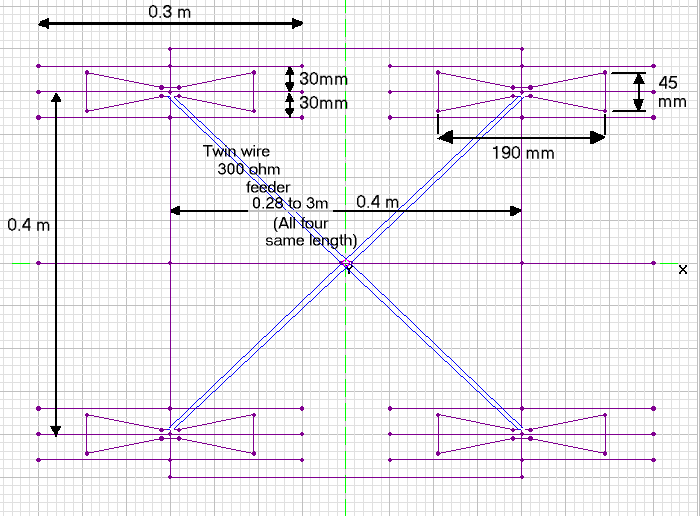 A Yagi being at least 1.5m long would not fit in my loft space either. The feeder system for the Lazy-H antenna is asymmetrical, so over a broad frequency range the phase of the half wave coupling line between the two pairs of end-fed dipoles will vary and this will tend to shift the antenna beam pattern. This is replaced in my design by separate feeds to each dipole. 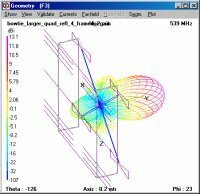 Arrays of dipoles fed by a symmetrical (or otherwise) transmission line network are well-known, and the feeder system is often described as a "corporate feed". An approximate impedance match to a 75 ohm cable is achieved by splitting the feed to four parallel 300 ohm feeds, which are connected to the terminals of folded dipoles. Ideally, a dipole of 75 ohms impedance will have its feed point impedance raised to 300 ohms by the folding method, but coupling effects and frequency variations will invevitably cause the impedance match to vary. Fortunately the importance of VSWR in receiving antennas is much lower than for transmitting antennas. The four 300 ohm twin wire ribbon cables connected between the dipoles and the balanced end of the balun should be approximately half a wavelength, as this results in a 1:1 transformation of the impedance at one end to the other end of the ribbon. Other lengths may result in wider VSWR variations. However, the physical layout is a limiting factor and results in the cables being a little bit longer than ideal. It is essential that the ends of the ribbon cables are all connected in the same sense and orientation at each of the dipoles, relative to the balanced terminals of the balun, and should fan out from the balun nicely without excessive twisting or crossing over. 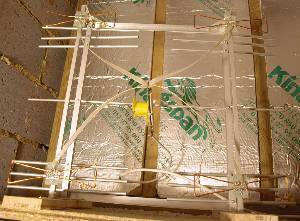 Each antenna dipole element has a set of three reflectors at a spacing of 0.1m behind it, and there is a central long reflector bar which does have some role in improving the beam pattern, reducing some of the sidelobes that appear at higher frequencies. After determining the basic layout and nominal dimensions from basic principles, the antenna was optimised for best performance using the 4NEC2 software package. The spacing of the elements from one another, and from their reflectors, affects the impedance of each element, and when combined, the entire antenna. Close spacing tends to reduce impedance but the overall effect can be reduced or increased if there is an impedance transformer in circuit. Larger spacings between elements tend to introduce minor pattern side-lobes (and very large spacings will create major lobes off-axis), and narrows the beam width of the main lobe. 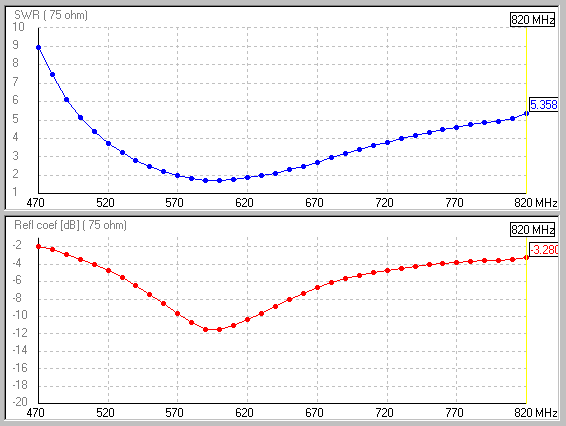 Reduced spacings between elements tends to reduce the gain and broaden the main lobe. The general aim was to achieve good gain and a reasonable directive pattern and VSWR performance across the whole of Bands IV and V, but especially in Groups A and B. After optimising with the 4NEC2 software, the layout and dimensions given below were arrived at which gave the best compromise coverage of the frequency range, ensuring performance in Group A and the bottom end of Group B. As it turns out the antenna appears to be usable over the whole of Bands IV and V with very little degradation at the high frequency end. When used with a pre-amplifier feeding the downlead to the TV, signal strengths were in the medium to good range, signal quality was high, and Viterbi bit error rate was below 1.0E-7 on all digital channels, which was indeed a better performance than the Yagi on the chimney. The Pawsey stub balun was constructed using an FR4 fibreglass PCB backing to provide a firm support for the coaxial cables. Underneath each quarter-wave section of cable is a strip of copper, the two sides designed to be as symmetrical as possible. There is a strip of copper cut away between the two cables, thus resulting in a U-shaped layout with a coaxial cable laid on top of each leg. At the point where one coaxial cable is connected and the other is grounded, a ground plane is provided on the underside of the PCB, but this ground plane is cut away under the cables and the legs of the U shape themselves. 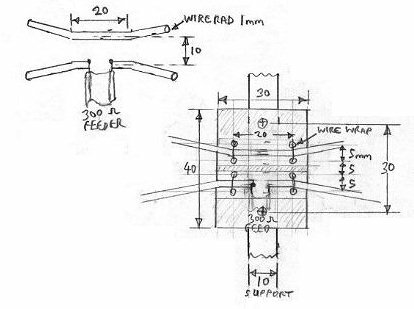 The ground plane is necessary beyond the common grounding point of the cables to support a microstrip line which connects the balun cable to the external feeder cable. It is only present under the microstrip line region. The microstrip line itself is an unbalanced feed; it is just a convenient method of connecting between the cable that is part of the balun and the external feed cable which is taken along the mid-point of the balun assembly. In the finished article, there is another piece of ground plane to support the feeder cable, with some aluminium clamps to hold it securely. A pair of nylon screws are used to attach the balun assembly to a plastic mounting piece which is attached to the central long reflector bar. The resulting design has maximum dimensions 0.7m horizontally and 0.5m vertically and has a gain of over 12dBi from 470 MHz to 740 MHz and over 11dBi up to at least 820 MHz. Please note that I am relying on 4NEC2 analysis for the gain and VSWR figures, backed up by the fact that the antenna works well in practice. Actual measurements of the antenna performance are not available - the measurement of antenna characteristics to a reasonable standard of accuracy requires expensive calibrated equipment and a good antenna test range, which unfortunately I do not have. The well-known Single Bay Gray Hoverman Gold Standard antenna has a gain of 14-15dBi and is a very fine design, but measures 0.67m horizontally and 0.84m vertically. As I had determined that anything bigger than 0.5m vertically would be problematical in the space I have available, I had to rule that antenna out. This design is made freely available for private or educational use only. No commercial use is permitted. Here is a set of photographs showing the finished antenna in situ.